Will Foreigners Decide the 2012 Election? 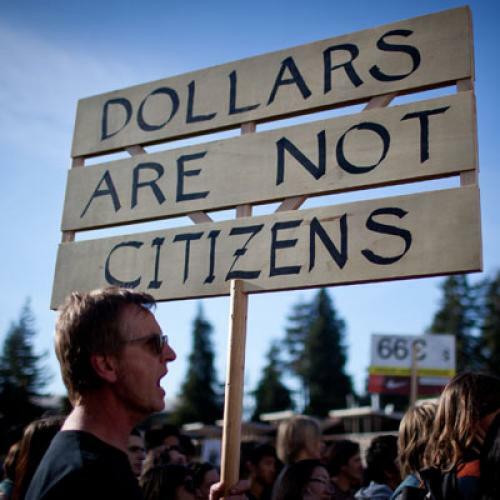 The Extreme Unintended Consequences of Citizens United. Let’s say that the leader of a foreign country, one with military or economic interests adverse to the United States, took a look at our 2012 elections and decided to spend millions of dollars in hopes of determining which party held control over the House, the Senate, or the White House. Most of us would consider that scenario highly distressing, to say the least. In that way, it's easy to understand why current federal law was designed to bar most foreign individuals, entities, and governments from spending money to influence U.S. elections and contributing to candidates. And this isn’t a law that inspires much opposition in Washington: Neither party asserts that foreigners have a First Amendment right to participate in our elections. But given the twisted logic of the Supreme Court’s recent decision in Citizens United v. FEC, the law’s constitutionality is now in question. Fortunately, the Court may be wise enough not to use its own flawed decision as a future roadmap. On Friday, Supreme Court justices will meet in a private conference to consider whether to hear Bluman v. FEC, a case that concerns the rights of foreign non-citizens living in the U.S to spend money in U.S. elections. Whether or not the Court sets the case for a full hearing, it is likely to conclude that our current law does not violate the First Amendment rights of foreigners. That would be the right result. But it would require ignoring the precedent of Citizens United v. FEC, which upheld similar rights for corporations. There are many good reasons for federal law to bar election-related spending by foreigners, but each runs headlong into the reasoning of the Supreme Court’s Citizens United case. First, under the Court’s 5-4 majority view of the First Amendment, when it comes to election-related spending the identity of the speaker does not matter—it is up to the public to determine whether or not to credit the speaker’s message. Second, the Court determined that Congress cannot limit disproportionate corporate spending, because such attempts to level the playing field are wholly impermissible under the First Amendment. Third, spending which is independent of candidates for office cannot corrupt those candidates or cause voters to lose confidence in the fairness of the electoral process. Fourth, the only thing which counts as corruption is the potential for a quid-pro-quo, not “ingratiation” with elected officials or the purchase of “access” to them. In its brief in the Bluman case asking the Supreme Court to dismiss the appeal, the U.S. points to national security reasons for the rule barring foreign spending in elections, as well as the Court’s long history of upholding laws barring aliens from participating in U.S. democratic institutions, such as a jury. But scratch beneath the surface and you see the very arguments which the Court rejected in Citizens United: Why worry about the Iranian government spending money on the Ben Nelson Nebraska U.S. Senate race if the identity of the speaker does not matter? The Court has told us that independent spending cannot corrupt or cause voters to lose confidence in the fairness of the process, and any concern about disproportionate spending by those with great resources is illegitimate. And who cares if a foreign oil magnate ingratiates himself through his spending on a U.S. House election in Texas, or buys access to the successful candidate in that election? The Court has already determined that that’s not corruption, right? In fact, we know these arguments ring false even to the author of the Citizens United decision, Justice Anthony Kennedy. Just a year before that decision, Justice Kennedy wrote for the Court (in an opinion joined only by the four Citizens United dissenters) that a West Virginia Supreme Court justice needed to recuse himself from a $50 million case involving Massey Energy. The West Virginia justice in question, who later cast the deciding vote in favor of Massey, depended in his election on $3 million in contributions from Massey’s CEO to an independent effort to elect him to the court. Justice Kennedy said in Caperton v. Massey that the independent disproportionate spending on the judge’s behalf justified recusal. This ruling runs completely counter to the logic of Citizens United. One of the key rhetorical moves in Citizens United was Justice Kennedy’s claim that the Court was restoring coherence to the law. Before that case, wealthy individuals and media corporations, but not other corporations, could spend unlimited sums to influence elections. Now all can spend. But the case of the foreign spending ban, as well as the Caperton case, shows that not all can spend, that the world of the First Amendment is hardly black and white, and that any ethically desirable approach to campaign finance law will have some inconsistencies. The key is to engage in careful balancing of First Amendment rights and interests such as preventing corruption. In their briefs before the Supreme Court, the Bluman plaintiffs point to some of my earlier writing noting the contradiction between the logic of Citizens United and the government’s position in this case. They—though not most of the campaign finance deregulation lobby, which (aside from the Institute for Justice) has sat out the case—urge the Court to hear the case, rather than simply affirm the lower court, to bring additional coherence to the law. But what the current challenge makes clear is that the Supreme Court has erred—not in its failure to extend election spending rights to foreign nationals, but in the faulty reasoning behind its decision in Citizens United. Richard L. Hasen, a professor of law and political science at UC Irvine, is the author of the forthcoming book, The Voting Wars: From Florida 2000 to the Next Election Meltdown.